Text: At last my guilty wishes are fulfilled! At last I am enabled to look back into the past, and think that one great object of my life has been realised, for I have seen a GHOST! Shade of (ah! by the way, I forget the name of the shade, and I’ve left the document which could inform me in my overcoat-pocket! never mind!) sacred shade, who appeared simultaneously to me and to some hundreds of entranced people, thou hast, so far as I am concerned, set the vexed question of apparitions at rest for ever. My interest in the ghost subject has been intense. I have read every story bearing upon it, and worked myself up to a delightful pitch of agonised excitement. Alone, and in the dead of night, do I peruse the precious volumes: the mere fact of the scene being laid in “an old castle in the Black Forest,” gives me a pleasing sensation of terror; when the student seated alone in the tapestried room finds “the lights begin to burn with a blue and spectral hue,” I shake; when there “reverberates through the long passages a dismal clanking of chains,” I shiver; finally, when “the door bursts open with a tremendous crash,” and there enters “a tall figure clothed in white, with one clot of gore immediately below its heart,” I am in a state of transcendent bliss, and only long to have been in the student’s place. Some years ago I thought I had a chance of realising my hopes. I read a book called, I think, The Nightgown of Nature, the author of which announced that he—or she— was thoroughly well acquainted with several houses where spectres appeared nightly with unexampled punctuality—houses “within a convenient distance from London, and accessible by rail,” as house-agents say—and I wrote to him—or her— for the address of one of these houses, stating that I intended to pass a night there. He—or she—replied that though his—or her—statement was thoroughly correct, he—or she— must decline giving the address of any particular house, as such a course would be detrimental to the value of the property, and might render him—or her— liable to an action at law on the part of the landlord. So I was disappointed. I heard, however, the other day, that a real ghost, real as to its unreality, its impalpability, its visionary nothingness, was to be seen in a remote and unknown region called Hoxton, I had previously heard that the same, or a similar spectre, haunted Regent-street, but I laughed at the notion. Regent-street! with the French boot-shop, and the ice-making man, and the Indian pickle depôt opposite! A ghost in juxtaposition to electrical machines, a diver who raps his helmet with halfpence, and the awful insects in the drop of water! But Hoxton—there was something ghostly in the very name, and the place itself was as unfamiliar to me as Tierra del Fuego. Nobody to whom I spoke knew anything about it; they “had heard the name;” it was “somewhere out north,” they thought. Ah! in an instant my fancy sketches the spot. A quaint old suburb, where the railway has not yet penetrated, where sleepy cows chew the cud of peace in quiet meadows, where ploughmen whistle o’er the lea (whatever that may happen to mean), where huge elms yet stand waving their giant limbs before square red brick mansions. One of these mansions for years untenanted, roofless, dismantled, a murder was committed in it years ago: an old man with silver hair, a spendthrift nephew, a box of gold, a carving knife, a well in garden where weapon is discovered years afterwards, a wailing cry at twelve P.M., a tottering figure wringing its hands—yes, that must be it, or something very like it! I determined to go to Hoxton that night. There was no railway—so far I was right—and I went to my destination in a cab. After a little time I found we were striking out of the great thoroughfares of commerce into narrow by-lanes, where a more pastoral style of living prevailed, where fried fish of a leathery appearance lay in tangled heaps on the slabs of windowless fish- shops, where jocund butchers, seemingly on the best terms with their customers, kept up a perpetual chorus of “Buy, buy!” and slapped the meat before them with a carving knife and a gusto that together seemed to give quite an appetite to the hesitating purchaser. We passed several graveyards deep set in the midst of houses—dank, frouzy, rank, run-to-seed places, where Pelions of “Sacred to the memory” were heaped upon Ossas of “Here lieth the remains,” and out of which the lank sapless grass trembled through the railings and nodded feebly at the passers-by. Good places for ghosts these! City ghosts of misers and confidential clerks, and trustees who committed suicide just before the young gentleman whom they had had in trust came of age, and would have infallibly found out all about their iniquities. I peered out of the cab in quest of any chance apparition, but saw none, and was very much astonished when the driver, to whom I had given particular instructions, pulled up before a brilliantly lighted doorway, round which several cadgers were disporting themselves. These youths received me with great delight, and one said, “You come along with me, sir! I’ll take you to the hout and houtest old spectre in the neighbr’ood. This way, sir!” He led the way along a lighted passage, between rough brick walls, until we arrived at a barrier, where—after a muttered conversation between my guide and the janitor—a shilling was demanded of me, after paying which I was provided with a card talisman and left to find my way alone. Down a broad passage on one side of which was a recess where sandwiches lay piled like deals in a timber-yard, where oranges were rolled up in pyramidal heaps of three feet high, and where there was so much ginger-beer that its simultaneous explosion must infallibly have blown the roof off the building, down a flight of asphalted stairs, at the bottom of which a fierce man wrung my card talisman from me and turned me into a large loose box, the door of which he shut behind me. A loose box with a couple of chairs in it, a looking-glass, a flap table—a loose box open on one side, looking through which opening I see hundreds of people ranged in tiers above each other. Turning to see what they are all intent on, I see a stage—I’m tricked! I’m done! the loose box is a private box, and I’m in a theatre. Left to myself, what could I do but look at the stage, and, doing that, how could I fail to be intensely interested? I speedily made myself acquainted with the legend being there theatrically developed, and, beyond that the colour was, perhaps, a little heightened, I did not find it more or less preposterously unlike anything that could, by any remote possibility, ever have occurred than is usual in dramatic legends. The scene of action being laid at the present time, I found the principal character represented to be a BARONET (he had a name, but he was invariably spoken of by everybody, either with yells of hatred or shoulder-shrugs of irony, as “the Baronet”), and certainly he was the most objectionable old gentleman I have ever seen. The mere fact of his walking about, in the present day, in a long claret coloured coat, a low crowned hat with a buckle in the front, and boots which, being apparently made of sticking- plaster, had tassels like bell-pulls, was in itself irritating; but his moral conduct was horrible. He seemed to have an insane desire for the possession of his neighbours’ property, not felonious in his intentions, but imbued with a buying mania, and rabidly ferocious when said neighbours refused to sell. First among his coveted possessions stood the house and garden of a clergyman’s widow (no mistake about her widowhood! the deepest black, and such a cap, all through the piece! ), who obstinately refused to part with an inch of her ground. Baronet smiles blandly, and informs us that he will “have recourse to stratyjum.” Widow has two daughters, one very deep-voiced and glum, the other with her hair parted on one side (which, theatrically, always means good nature), and funny. Funny daughter is beloved by Baronet’s son—unpleasant youth in cords, top-boots, and a white hat, made up after Tom King the highwayman, vide Turpin’s Ride to York; or, The Death of Black Bess (Marks, Seven Dials), passim. Baronet proposes that son should get clergyman’s daughter to steal lease of premises, promising to set son up in life, and allow him to marry object of affections. Son agrees, works upon daughter’s vanity; daughter, who is vague in Debrett, is overcome by notion of being called the Right Honourable Mrs.——, a title which, as the wife of a baronet’s son, she is clearly entitled to—steals the lease, hands it to son, who hands it to Baronet, who, having got it, nobly repudiates not merely the whole transaction, but son into the bargain: tells him he is not son, but merely strange child left in his care, and comes down and winks at audience, who howl at him with rage. That was the most wonderful thing throughout the evening, the contest between the audience and the Baronet. Whenever the Baronet made a successful move (and Vice had it all its own way for nearly a couple of hours), the audience howled and raved against him, called “Yah!” whistled, shrieked, and hooted, and the Baronet advanced to the footlights and grinned across them, as though he should say, “I’m still all right in spite of you!” When a villain who, for a sum of money advanced by the Baronet, had murdered an old man, and was afterwards seized with remorse, stole the lease from the Baronet’s pocket, the multitude in the theatre cheered vociferously; but the Baronet, after proving that the purloined parchment was only a copy, and not the original document, which he still retained, calmly walked down to the front of the stage, and literally winked at the people, tapping his breast, where the lease was, in derision, and goading the audience to the extremity of frenzy. There were several pleasant episodes in which the Baronet was the mainspring: hiding fifty-pound notes in the glum sister’s bundle, accusing her of robbery, and having her locked up in his house, whence she was rescued by the murdering villain who had previously (out of remorse) set the house on fire; but at length the widow, who a minute before had been remarkably lively, and had “given it” to the Baronet with great vehemence and cap-shaking, suddenly declared her intention of dying, and though a young gentleman with a sugarloaf hat and a coat with a little cape to it, like the pictures of Robespierre, announced himself as a lawyer, who would defend her and hers against anything and everybody, she forthwith carried out her intention, sat down on a chair, and died, out of hand. There was a faint pretext of sending for the doctor, but there was an evident fear on the part of most lest that practitioner should really restore the patient, and thus burk the great effect of the piece, so the idea was overruled, and the Baronet, advancing to the footlights, rubbed his hands in derision at the audience, and the audience, cognisant of the fact that the decease of the widow was necessary to the subsequent appearance of her ghost, merely answered with a subdued “Yah!” At this point my former conductor opened the box-door and beckoned me out. “Come in front,” he said; “it’s ghost time!” The words thrilled to my very soul, I followed him in silence, and took my place in the boxes, close by a lady whose time was principally occupied in giving natural sustenance to her infant, and an older female, apparently the child’s grandmother, who was a victim to a disease which I believe is popularly known as the “rickets,” and which impelled her at three-minute intervals to shudder throughout her frame, to rock herself to and fro, to stuff the carved and hooked black bone handle of an umbrella, that looked like a tied-up lettuce, into her mouth, and to grind out from between her teeth, clenched round the umbrella-handle, “Oh, deary deary me!” On my other side were a youth and maiden, so devoted to each other that they never perceived my entrance into the box, and I had not merely to shout, but to shove, before I could effect a passage, when there was such a disentanglement of waists from arms, and interlaced hot hands, and lifting of heads from shoulders, that I felt uncomfortable and apologetic, whereas the real offenders speedily fell back into their old position, and evidently regarded me as a Byronic creature, to whom life was a blank. The ghost did not appear at once. Though the widow had slipped into a very stiff position in her chair, and everybody around her had said either “Ha!” or “The fatal moment!” or “Alas!” or “All is over!” as their several tastes led them, it was thought necessary to make the fact of her death yet more clear, so upon the front parlour, where the sad occurrence took place, fell a vast body of clouds of the densest kind, out of which, to slow music, there came two or three ethereal persons with wings, which wagged in a suspicious manner, bearing the widow’s body “aloft,” as Mr. Dibdin has it with reference to Tom Bowling, and thereby copying in the most direct and unequivocal manner (but not more directly and unequivocally than I have seen it in theatres of grand repute, where critics babbled of the manager’s transcendent stage- direction) Herr Lessing’s picture of Leonore. To meet these, emerged, in midair from either side of the stage, other ethereal persons, also with wings, whose intended serenity of expression was greatly marred by the obstinacy of the machinery, which propelled them in severe jerks, at every one of which the set smile on their faces faded into a mingled expression of acute bodily pain and awful terror lest they should fall down: while, on a string like larks, or a rope like onions, there swayed to and fro across the proscenium, a dozen of the stoutest and most unimaginative naked Cupids that ever got loose from a valentine, or were made by a property- man. As the act-drop fell upon this scene, which in itself represented something not to be met with in everyday life, some distrust was expressed in my neighbourhood lest there should be nothing more ghostly than we had just witnessed, but the old lady with the umbrella set us to rights by recovering suddenly from a severe attack of rickets, and exclaiming, “Them ghosts! Oh no, sir! In the next act we shall see her, and which the music will play up for us to give attention.” So accordingly, when the fiddles wailed, and the trombone and clarionet prostrated themselves figuratively in the dust, I looked with all my eyes, and saw the curtain rise upon the Baronet’s apartment, which was the most singularly constructed room I ever beheld. The portion of the floor nearest to us was perfectly flat, as is the case with most floors, but after about three feet of flatness there rose in its centre, and stretching from side to side, a long, sloping, green mound, in military language a “glacis,” up which the Baronet had to walk when he wanted to proceed towards the back of the apartment, where all the chairs, tables, and furniture generally had withdrawn themselves, and up which he himself climbed, as though M. Vauban had taken the place of Mr. Cubitt, and as though outworks and entrenchments were as common in London drawing-rooms as lounging-chairs and grand pianos. On the top of this entrenchment stood, on either side, two thick dumpy pillars, supporting a heavy piece of masonry, which joined them together at the top, and which looked like a portion of the ruins of the Temple of the Sun at Baalbek seen through the wrong end of the opera-glass: or, to use an illustration nearer home, like the front of the catacombs of Kensal- green or Highgate cemeteries. Between these pillars was a hazy vista into which the Baronet walked, and seating himself on a stool in the corner, so as to be quite out of the way, commenced informing us (without any apparent necessity for the statement) of his disbelief in all supernatural appearances, and of his thorough contempt for Death—ha! ha! The second of the two vocal double-knocks given by him in ha! ha! had scarcely been given, when there appeared in the middle of the empty space behind the pillars a stereoscopic skeleton exactly like that which dances in the Fantoccini—so like, that one looked for the string which guides that puppet’s movements (and which, of course, in the present instance, was not to be seen), and expected him momentarily to fall to pieces and re-unite in a comic manner. At this sight the Baronet appeared a little staggered; he said, “Ha! do I then behold thee?” and retreated several paces on his heels, but recovering himself, exclaimed, “‘Tis a dream, an ill-yousion!” and advanced towards the skeleton, which disappeared, to return immediately armed with a dart, or harpoon, with which it made several well-intentioned but harmless thrusts at the Baronet, who appeared immensely flabbergasted by the harpoon, and begged piteously to be spared. Either the skeleton was moved by the appeal or he had work somewhere else, for he disappeared again, and no sooner was he gone than the Baronet so plucked up that he declared he defied Death altogether, and was beginning to be offensively joyous, when in the place where the skeleton had been, appeared the ghost of the widow in her shroud! No mistake about it now! There she was, a little foreshortened, a little out of the perpendicular, leaning forward as though accustomed to a cramped and confined space, and not daring to stand upright! For the Baronet this was, to use a vulgar metaphor, a “corker.” He rubbed his head, but there was nothing there; he tried a taunt, but the ghost answered him with deep-voiced briskness; he rushed towards her, and rushed right through her! Finally, he picked up from the table, where, as we know, they always lay in libraries, a long sword, with which he aimed a very unskilful blow at his visitant. The sword passed through the ghost, who was apparently tickled, for it exclaimed, “Ha! ha!” and disapeared, and the Baronet fell exhausted in the very spot where the ghost had been! Up went the lights, down went the curtain, and the audience gave one great gasp of relief, and pretended they hadn’t been frightened—which they had! Unquestionably! undoubtedly! The skeleton had been a failure; ribalds in the pit had mocked at him—had given tremulous cries of feigned terror—shouted “O-oh! m—y!” and pretended to bury their heads in their jacket-collars; boys in the gallery had called upon him to dance, and had invited their friends to “look at his crinoline;” the arm of the youth in front of me tightened round the waist of the maiden with evident conveyance of the idea that that alone could them part; and the old lady with the umbrella had considered him a “mangy lot.” But the ghost was a very different matter; when it appeared, not a sound in the pit, not a whisper in the gallery; all open-mouthed, eager, tremulous excitement! The old grandmother clasped the umbrella like a divining-rod, and muttered a hoarse “Deary—dea—ry me!” the mother let the infant fall flat and flaccid on her lap, the youth’s arm unbent, and the maiden, rising stiffly three inches from her seat, said, “Go’as!” and remained rigid. Only one sound floated on the air, and that was emitted by a French gentleman, with more buttons on his waistcoat than I ever saw on a similar amount of cloth (how on earth did a foreigner penetrate to Hoxton? ), who clutched his curly-brimmed hat between his fat fists and hissed out, “A—h! Superbe!” It was his testimony and it is mine! Comments: Edmund Hodgson Yates (1831-1894) was a British journalist and author. He was a good friend of Charles Dickens, to whose journal All the Year Round he was a regular contributor. Yates reports on a production of the play The Widow and Orphans; or, Faith, Hope and Charity, by C.H. Hazelwood, which featured at the Britannia Theatre, Hoxton, London as a means to showcase the invention of ‘The Ghost’ or ‘Pepper’s Ghost‘. This was an optical illusion invented by Henry Dircks and exploited professionally by John Henry Pepper – in which, by means of projected light and a hidden inclined sheet of glass, the reflection of a ghost-like figure could be made to materialise on a stage. 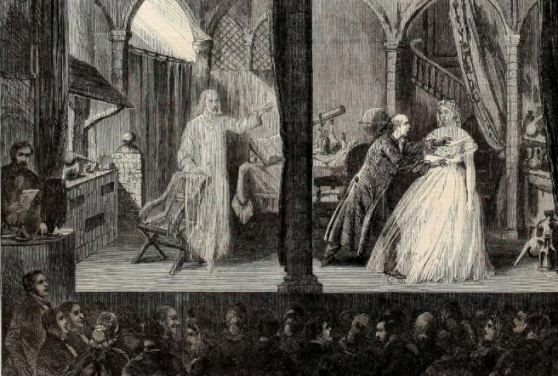 It first featured in a stage production of Dickens’s novella The Haunted Man at the Royal Polytechnic on 24 December 1862. In The Widow and Orphans the ghost was played by Mary Henderson. Text: I shut the door of my lodging behind me, and came out into the streets at six on a drizzling Saturday evening in the last past month of January, all that neighbourhood of Covent-garden looked very desolate. It is so essentially a neighbourhood which has seen better days, that bad weather affects it sooner than another place which has not come down in the World. In its present reduced condition it bears a thaw almost worse than any place I know. It gets so deadfully low-spirited when damp breaks forth. Those wonderful houses about Drury-lane Theatre, which in the palmy days of theatres were prosperous and long-settled places of business, and which now change hands every week, but never change their character of being divided and sub-divided on the ground floor into mouldy dens of shops where an orange and half-a-dozen nuts, or a pomatum-pot, one cake of fancy soap, and a cigar box, are offered for sale and never sold, were most ruefully contemplated that evening, by the statue of Shakespeare, with the rain-drops coursing one another down its innocent nose. Those inscrutable pigeon-hole offices, with nothing in them (not so much as an inkstand) but a model of a theatre before the curtain, where, in the Italian Opera season, tickets at reduced prices are kept on sale by nomadic gentlemen in smeary hats too tall for them, whom one occasionally seems to have seen on race-courses, not wholly unconnected with strips of cloth of various colours and a rolling ball—those Bedouin establishments, deserted by the tribe, and tenantless, except when sheltering in one corner an irregular row of ginger-beer bottles, which would have made one shudder on such a night, but for its being plain that they had nothing in them, shrunk from the shrill cries of the news-boys at their Exchange in the kennel of Catherine-street, like guilty things upon a fearful summons. At the pipe-shop in Great Russell-street, the Death’s-head pipes were like theatrical memento mori, admonishing beholders of the decline of the playhouse as an Institution. I walked up Bow-street, disposed to be angry with the shops there, that were letting out theatrical secrets by exhibiting to work-a-day humanity the stuff of which diadems and robes of kings are made. I noticed that some shops which had once been in the dramatic line, and had struggled out of it, were not getting on prosperously—like some actors I have known, who took to business and failed to make it answer. In a word, those streets looked so dull, and, considered as theatrical streets, so broken and bankrupt, that the FOUND DEAD on the black board at the police station might have announced the decease of the Drama, and the pools of water outside the fire-engine maker’s at the corner of Long-acre might have been occasioned by his having brought out the whole of his stock to play upon its last smouldering ashes. What Theatre? Her Majesty’s? Far better. Royal Italian Opera? Far better. Infinitely superior to the latter for hearing in; infinitely superior to both, for seeing in. To every part of this Theatre, spacious fire-proof ways of ingress and egress. For every part of it, convenient places of refreshment and retiring rooms. Everything to eat and drink carefully supervised as to quality, and sold at an appointed price; respectable female attendants ready for the commonest women in the audience; a general air of consideration, decorum, and supervision, most commendable; an unquestionably humanising influence in all the social arrangements of the place. Surely a dear Theatre, then? Because there were in London (not very long ago) Theatres with entrance-prices up to half-a-guinea a head, whose arrangements were not half so civilised. Surely, therefore, a dear Theatre? Not very dear. A gallery at three-pence, another gallery at fourpence, a pit at sixpence, boxes and pit-stalls at a shilling, and a few private boxes at half-a-crown. My uncommercial curiosity induced me to go into every nook of this great place, and among every class of the audience assembled in it—amounting that evening, as I calculated, to about two thousand and odd hundreds. Magnificently lighted by a firmament of sparkling chandeliers, the building was ventilated to perfection. My sense of smell, without being particularly delicate, has been so offended in some of the commoner places of public resort, that I have often been obliged to leave them when I have made an uncommercial journey expressly to look on. The air of this Theatre was fresh, cool, and wholesome. To help towards this end, very sensible precautions had been used, ingeniously combining the experience of hospitals and railway stations. Asphalt pavements substituted for wooden floors, honest bare walls of glazed brick and tile—even at the back of the boxes—for plaster and paper, no benches stuffed, and no carpeting or baize used; a cool material with a light glazed surface, being the covering of the seats. These various contrivances are as well considered in the place in question as if it were a Fever Hospital; the result is, that it is sweet and healthful. It has been constructed from the ground to the roof, with a careful reference to sight and sound in every corner; the result is, that its form is beautiful, and that the appearance of the audience, as seen from the proscenium—with every face in it commanding the stage, and the whole so admirably raked and turned to that centre, that a hand can scarcely move in the great assemblage without the movement being seen from thence—is highly remarkable in its union of vastness with compactness. 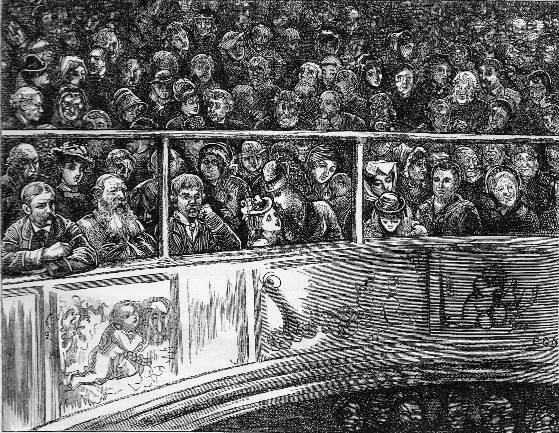 The stage itself, and all its appurtenances of machinery, cellarage, height and breadth, are on a scale more like the Scala at Milan, or the San Carlo at Naples, or the Grand Opera at Paris, than any notion a stranger would be likely to form of the Britannia Theatre at Hoxton, a mile north of St. Luke’s Hospital in the Old-street-road, London. The Forty Thieves might be played here, and every thief ride his real horse, and the disguised captain bring in his oil jars on a train of real camels, and nobody be put out of the way. This really extraordinary place is the achievement of one man’s enterprise, and was erected on the ruins of an inconvenient old building in less than five months, at a round cost of five-and-twenty thousand pounds. To dismiss this part of my subject, and still to render to the proprietor the credit that is strictly his due, I must add that his sense of the responsibility upon him to make the best of his audience, and to do his best for them, is a highly agreeable sign of these times. As the spectators at this theatre, for a reason I will presently show, were the object of my journey, I entered on the play of the night as one of the two thousand and odd hundreds, by looking about me at my neighbours. We were a motley assemblage of people, and we had a good many boys and young men among us; we had also many girls and young women. To represent, however, that we did not include a very great number, and a very fair proportion of family groups, would be to make a gross mis-statement. Such groups were to be seen in all parts of the house; in the boxes and stalls particularly, they were composed of persons of very decent appearance, who had many children with them. Among our dresses there were most kinds of shabby and greasy wear, and much fustian and corduroy that was neither sound nor fragrant. The caps of our young men were mostly of a limp character, and we who wore them, slouched, high-shouldered, into our places with our hands in our pockets, and occasionally twisted our cravats about our necks like eels, and occasionally tied them down our breasts like links of sausages, and occasionally had a screw in our hair over each cheek-bone with a slight Thief-flavour in it. Besides prowlers and idlers, we were mechanics, dock-labourers, costermongers, petty tradesmen, small clerks, milliners, stay-makers, shoe-binders, slop-workers, poor workers in a hundred highways and byways. Many of us—on the whole, the majority—were not at all clean, and not at all choice in our lives or conversation. But we had all come together in a place where our convenience was well consulted, and where we were well looked after, to enjoy an evening’s entertainment in common. We were not going to lose any part of what we had paid for through anybody’s caprice, and as a community we had a character to lose. So, we were closely attentive, and kept excellent order; and let the man or boy who did otherwise instantly get out from this place, or we would put him out with the greatest expedition. 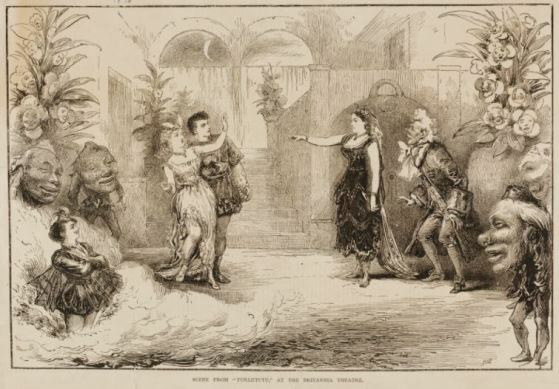 We began at half-past six with a pantomime—with a pantomime so long, that before it was over I felt as if I had been travelling for six weeks—going to India, say, by the Overland Mail. The Spirit of Liberty was the principal personage in the Introduction, and the Four Quarters of the World came out of the globe, glittering, and discoursed with the Spirit, who sang charmingly. We were delighted to understand that there was no liberty anywhere but among ourselves, and we highly applauded the agreeable fact. In an allegorical way, which did as well as any other way, we and the Spirit of Liberty got into a kingdom of Needles and Pins, and found them at war with a potentate who called in to his aid their old arch enemy Rust, and who would have got the better of them if the Spirit of Liberty had not in the nick of time transformed the leaders into Clown, Pantaloon, Harlequin, Columbine, Harlequina, and a whole family of Sprites, consisting of a remarkably stout father and three spineless sons. We all knew what was coming when the Spirit of Liberty addressed the king with a big face, and His Majesty backed to the side-scenes and began untying himself behind, with his big face all on one side. Our excitement at that crisis was great, and our delight unbounded. After this era in our existence, we went through all the incidents of a pantomime; it was not by any means a savage pantomime, in the way of burning or boiling people, or throwing them out of window, or cutting them up; was often very droll; was always liberally got up, and cleverly presented. I noticed that the people who kept the shops, and who represented the passengers in the thoroughfares, and so forth, had no conventionality in them, but were unusually like the real thing—from which I infer that you may take that audience in (if you wish to) concerning Knights and Ladies, Fairies, Angels, or such like, but they are not to be done as to anything in the streets. I noticed, also, that when two young men, dressed in exact imitation of the eel-and-sausage-cravated portion of the audience, were chased by policemen, and, finding themselves in danger of being caught, dropped so suddenly as to oblige the policemen to tumble over them, there was great rejoicing among the caps—as though it were a delicate reference to something they had heard of before. The Pantomime was succeeded by a Melo-Drama. Throughout the evening I was pleased to observe Virtue quite as triumphant as she usually is out of doors, and indeed I thought rather more so. We all agreed (for the time) that honesty was the best policy, and we were as hard as iron upon Vice, and we wouldn’t hear of Villainy getting on in the world—no, not on any consideration whatever. I could not possibly say to myself as the discourse proceeded, that the minister was a good speaker. I could not possibly say to myself that he expressed an understanding of the general mind and character of his audience. There was a supposititious working-man introduced into the homily, to make supposititious objections to our Christian religion and be reasoned down, who was not only a very disagreeable person, but remarkably unlike life—very much more unlike it than anything I had seen in the pantomime. The native independence of character this artisan was supposed to possess, was represented by a suggestion of a dialect that I certainly never heard in my uncommercial travels, and with a coarse swing of voice and manner anything but agreeable to his feelings, I should conceive, considered in the light of a portrait, and as far away from the fact as a Chinese Tartar. There was a model pauper introduced in like manner, who appeared to me to be the most intolerably arrogant pauper ever relieved, and to show himself in absolute want and dire necessity of a course of Stone Yard. For, how did this pauper testify to his having received the gospel of humility? A gentleman met him in the workhouse, and said (which I myself really thought good-natured of him), ‘Ah, John? I am sorry to see you here. I am sorry to see you so poor.’ ‘Poor, sir!’ replied that man, drawing himself up, ‘I am the son of a Prince! My father is the King of Kings. My father is the Lord of Lords. My father is the ruler of all the Princes of the Earth!’ &c. And this was what all the preacher’s fellow-sinners might come to, if they would embrace this blessed book—which I must say it did some violence to my own feelings of reverence, to see held out at arm’s length at frequent intervals and soundingly slapped, like a slow lot at a sale. Now, could I help asking myself the question, whether the mechanic before me, who must detect the preacher as being wrong about the visible manner of himself and the like of himself, and about such a noisy lip-server as that pauper, might not, most unhappily for the usefulness of the occasion, doubt that preacher’s being right about things not visible to human senses? Again. Is it necessary or advisable to address such an audience continually as ‘fellow-sinners’? Is it not enough to be fellow-creatures, born yesterday, suffering and striving to-day, dying to-morrow? By our common humanity, my brothers and sisters, by our common capacities for pain and pleasure, by our common laughter and our common tears, by our common aspiration to reach something better than ourselves, by our common tendency to believe in something good, and to invest whatever we love or whatever we lose with some qualities that are superior to our own failings and weaknesses as we know them in our own poor hearts—by these, Hear me!—Surely, it is enough to be fellow-creatures. Surely, it includes the other designation, and some touching meanings over and above. Again. There was a personage introduced into the discourse (not an absolute novelty, to the best of my remembrance of my reading), who had been personally known to the preacher, and had been quite a Crichton in all the ways of philosophy, but had been an infidel. Many a time had the preacher talked with him on that subject, and many a time had he failed to convince that intelligent man. But he fell ill, and died, and before he died he recorded his conversion—in words which the preacher had taken down, my fellow-sinners, and would read to you from this piece of paper. I must confess that to me, as one of an uninstructed audience, they did not appear particularly edifying. I thought their tone extremely selfish, and I thought they had a spiritual vanity in them which was of the before-mentioned refractory pauper’s family. All slangs and twangs are objectionable everywhere, but the slang and twang of the conventicle—as bad in its way as that of the House of Commons, and nothing worse can be said of it—should be studiously avoided under such circumstances as I describe. The avoidance was not complete on this occasion. Nor was it quite agreeable to see the preacher addressing his pet ‘points’ to his backers on the stage, as if appealing to those disciples to show him up, and testify to the multitude that each of those points was a clincher. And now, I am brought to the fact, that the lowest part of the audience of the previous night, was not there. There is no doubt about it. There was no such thing in that building, that Sunday evening. I have been told since, that the lowest part of the audience of the Victoria Theatre has been attracted to its Sunday services. I have been very glad to hear it, but on this occasion of which I write, the lowest part of the usual audience of the Britannia Theatre, decidedly and unquestionably stayed away. When I first took my seat and looked at the house, my surprise at the change in its occupants was as great as my disappointment. To the most respectable class of the previous evening, was added a great number of respectable strangers attracted by curiosity, and drafts from the regular congregations of various chapels. It was impossible to fail in identifying the character of these last, and they were very numerous. I came out in a strong, slow tide of them setting from the boxes. Indeed, while the discourse was in progress, the respectable character of the auditory was so manifest in their appearance, that when the minister addressed a supposititious ‘outcast,’ one really felt a little impatient of it, as a figure of speech not justified by anything the eye could discover. The time appointed for the conclusion of the proceedings was eight o’clock. The address having lasted until full that time, and it being the custom to conclude with a hymn, the preacher intimated in a few sensible words that the clock had struck the hour, and that those who desired to go before the hymn was sung, could go now, without giving offence. No one stirred. The hymn was then sung, in good time and tune and unison, and its effect was very striking. A comprehensive benevolent prayer dismissed the throng, and in seven or eight minutes there was nothing left in the Theatre but a light cloud of dust. There is a third head, taking precedence of all others, to which my remarks on the discourse I heard, have tended. In the New Testament there is the most beautiful and affecting history conceivable by man, and there are the terse models for all prayer and for all preaching. As to the models, imitate them, Sunday preachers—else why are they there, consider? As to the history, tell it. Some people cannot read, some people will not read, many people (this especially holds among the young and ignorant) find it hard to pursue the verse-form in which the book is presented to them, and imagine that those breaks imply gaps and want of continuity. Help them over that first stumbling-block, by setting forth the history in narrative, with no fear of exhausting it. You will never preach so well, you will never move them so profoundly, you will never send them away with half so much to think of. Which is the better interest: Christ’s choice of twelve poor men to help in those merciful wonders among the poor and rejected; or the pious bullying of a whole Union-full of paupers? What is your changed philosopher to wretched me, peeping in at the door out of the mud of the streets and of my life, when you have the widow’s son to tell me about, the ruler’s daughter, the other figure at the door when the brother of the two sisters was dead, and one of the two ran to the mourner, crying, ‘The Master is come and calleth for thee’?—Let the preacher who will thoroughly forget himself and remember no individuality but one, and no eloquence but one, stand up before four thousand men and women at the Britannia Theatre any Sunday night, recounting that narrative to them as fellow creatures, and he shall see a sight! Comments: Charles Dickens (1812-1870) was a British novelist and journalist. All the Year Round was a periodical owned by Dickens, for which one of his major contributions as a writer was the series of travel articles later collected as The Uncommercial Traveller (originally 1861, but expanded subsequently). The Britannia Theatre in Hoxon, London, was founded by Samuel Haycraft Lane in 1858, replacing an earlier, smaller theatre. It seated 3,000 (originally nearly 4,000 including those standing). Dickens was a regular visitor. The building became a cinema in 1913 but was destroyed in the Blitz in 1940.